Published by Cyril Huze May 12th, 2016	in Accessories and Editorial. Sized just right for the daily work commute, the Premium Touring Day Bag (P/N 93300017, $109.95 features an innovative mounting system that slips over a passenger backrest to make installation and removal a snap. A low-profile spandex band slips over a passenger backrest for a snug and secure fit, and the bag can be cinched in place with the adjustable mounting straps. The spandex material reverts back to its original shape when the bag is removed. The Premium Day Bag features two exterior pockets and one zippered mesh interior pocket. The bag and its integrated rain cover feature 3M™ Scotchlight reflective piping and graphics for added visibility. Its dimensions are: 13 inches wide x 10 inches deep x 9 inches tall, and its capacity is 900 cubic inches. For additional versatility, this bag can be equipped with a Premium Shoulder Strap (P/N 93300014, $14.95) for easy handling. 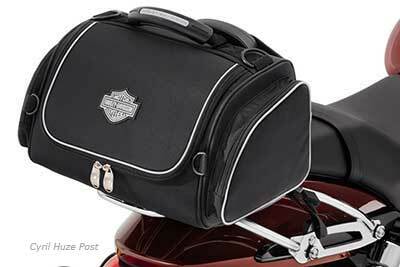 Installation requires a sissy bar upright, backrest pad, and luggage rack (if not mounting the bag on a passenger pillion). Available at more than 750 authorized retail locations in the United States and online. I have one that I have been using a while. Good piece of gear and with a Q.D. Luggage rack it is like a mini tour pack on my Switchback. Decent 12 pack long necks size. Très beau sac! !dommage qu’il ne soit pas en cuir.